Live system means system should be Up and connected and reachable inside Network. If system is not connected in the network or down is called dead system. We have two method to check live system one is single system scanning another scan multiple systems at once. 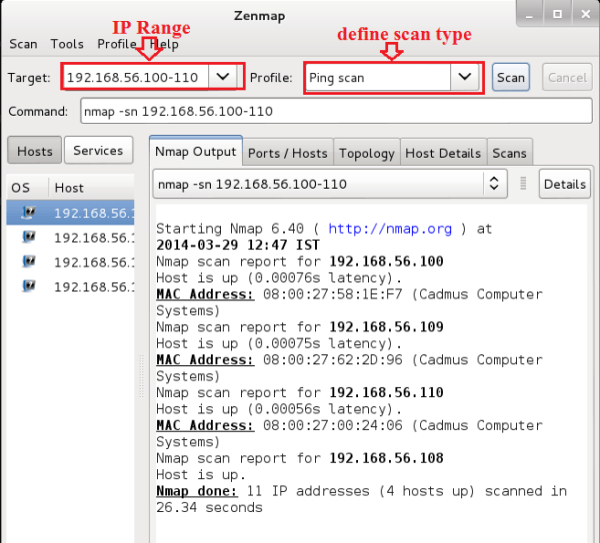 Ping checks live system with the help of ICMP scanning. Ping scan sends ICMP ECHO request to a host. If the host is live, it will return an ICMP ECHO reply. No reply means host is dead. Sometimes firewall discards ICMP ECHO request so We cant identify host is live or dead. Ping sweep is used to check live systems in network within rang of IP addresses. If multiple hosts are connected in the network, to find out live hosts is a big challenge for Pen Tester. Ping Sweep is useful in this condition. In this scanning method Attacker sends ICMP requests to multiple Systems. If host is alive it will return ICMP reply. Ping sweep is performed by multiple tools for windows as well as for Linux.